Make the holiday season one to remember with this collection of fun and festive kids' Christmas crafts in this FREE eBook! Bring Whoville into your home this Christmas with a Converted Cardboard Christmas Village. As a bright decoration or as a city for your toys, convert trash into town treasure with this toilet paper roll craft. You'll be filled with joy as you turn cardboard tubes into beautifully festive buildings. Name your town something creative and fun, and see how it affects the way you decorate its houses. What kind of traditions does your Christmas village have? Let your imagination run wild with this cheery craft. Cut cardboard tubes into two pieces each. Cut one evenly in half. Cut the other two so that you have two large pieces and two small pieces. This will give you varied heights for the buildings. Cut white paper into 6-inch long pieces. The height should be about an inch taller than each tube. Cut out doors from colored construction paper, and add a door knob using marker. Cut out small squares for windows from yellow construction paper. Use marker to draw window lines. Use glue stick to attach windows and doors to the white paper strips. Cover the back of the white paper with your glue stick, then attach it to the cardboard tube. Fold the excess paper inside the tube and secure. Use colored construction paper to make simple cone shapes for roofs and hot glue them in place. Make trees from green construction paper. Use a small paintbrush to "draw" on a few lines going around the trees and sprinkle with glitter. Knock off excess. Use a small paintbrush to paint glue along the edge of each building's roof and sprinkle with white glitter. Knock off excess. For the church, cut the ends off of a toothpick to make them blunt. Cut toothpick in two pieces, one longer than the other. Hot glue the toothpick into a cross, and glue the long end inside the top of the church roof. When dry, paint the cross with white glue and sprinkle with gold glitter, tap off excess. Recycled crafts transform used objects into completely fresh kids' masterpieces! 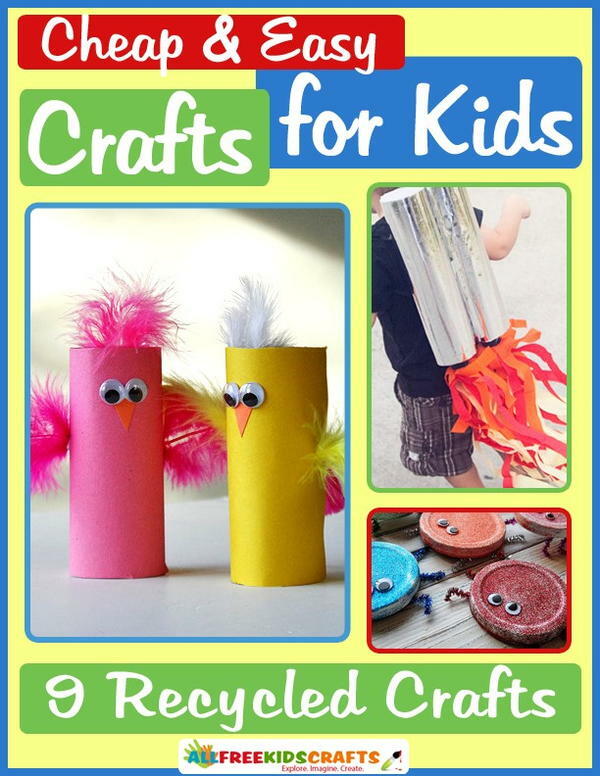 The free projects in Cheap and Easy Crafts for Kids: 9 Recycled Crafts are wonderful for kids young and old, female and male, artsy and crafty.